Rest in peace, Albert. 60 years ago today, Albert Einstein died at Princeton Hospital. In accordance with his wishes, his body was cremated. But something was missing when they placed Einstein's body into the incinerator: his brain. The pathologist on call, Thomas Harvey, had removed it without permission. When it became public a few days later, Harvey convinced Einstein's son to bless the misadventure as long as it was only used for scientific research. Harvey's boss at the hospital wasn't so understanding, and fired Harvey for his transgression. But Harvey kept Einstein's brain. 240 pieces of it, to be exact, stored in jars of formaldehyde at his house. His obsession with the brain led him to lose his marriage. So he moved to the Midwest (to my home town of Wichita). There he claimed to be researching Einstein's brain--even though he was not a trained brain scientist--but never published anything. Harvey eventually said he could find nothing unusual about it. 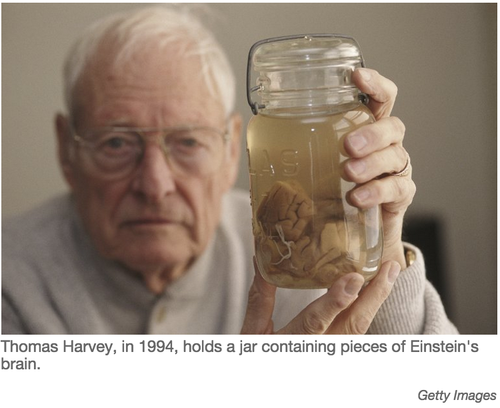 He finally surrendered what was left of Einstein's brain back to Princeton Hospital in 1996. (Read the book Driving Mr. Albert for an account of Harvey's unbelievable road trip with the brain back to New Jersey.) Scientists at Princeton discovered Einstein's brain was actually was quite remarkable. It was 15% wider than normal because its inferior parietal regions were over-developed. This probably contributed to Einstein's visualization and mathematical skills. His brain also lacked the groove usually traversing this region, suggesting his neurons were better able to work together. To this day, his brain remains in jars of formaldehyde at Princeton Hospital. And it was that brain which inspired the name for Curious. For it was Einstein who said: "I have no special talent. I am only passionately curious." io9.com: "This Is Why Einstein's Brain Was Better Than Yours"
NPR: "The Long, Strange Journey of Einstein's Brain"
Now I Know: "The Whereabouts of Dr. Einstein's Brain"